Comfort food comes straight to you thanks to The Bowl Company. From desi home food to a big selection of global cuisine, this delivery service understands hunger! 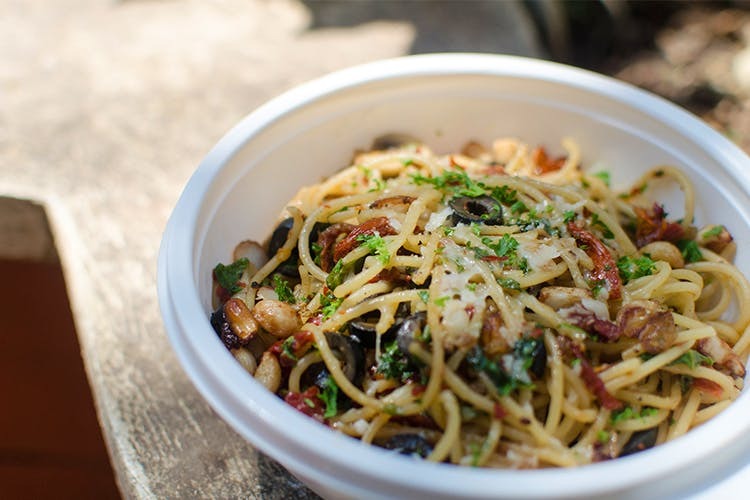 By name and by nature, The Bowl Company is the latest delivery service to hit the Bangalore market. The idea of the company is to bring you comfort food so think slightly rich flavours and even carbs. They don’t want you to count calories. We got ourselves some India, Asian and European food – maybe a bit too much. The Wasabi Ginger Chicken And Thai Red Curry with Sticky Rice was delicious although we ran out of curry before we got through the portion of rice. The chicken was not quite authentic but fried and crisp, we liked it! From the World Bowl section (which offers grilled meats, seafood in various sauces and pastas) came Texas BBQ Chicken and Peri Peri Chicken. The first arrived with a flavourful butter basil rice and the latter with egg corn rice. The Peri Peri won our hearts for its piquant hit, but the BBQ was a close second – just a tad too sweet perhaps. We’re huge fans of the fact that they send extra sauce with the dishes. Aglio Olio Spaghetti with mushrooms and a heavy dose of oil tasted just like Mamma makes, and is large enough to actually share. Oh, you want desi khana? They’ve got a good selection — from Goan Prawn Curry to Butter Chicken. We ordered the Naani Ki Kadhi Chawal and oh, how comforting it was. Never mind that we probably slept through the afternoon meeting later. Butter Chicken with Jeera Rice wasn’t a hit, mostly because it was too sweet. Both from the half-and-half section, we suggest you order this for two people as it’s really filling. They even have breakfast and snacking options if you'd rather eat light. Currently they service the Koramangala, HSR Indiranagar BTM, Whitefield (and extensions) areas through Swiggy only, as of now, we can’t wait for their delivery to go city-wide. They tend to be more generous with the rice than with the rice (or it's packed in a way that the curry usually runs out faster than the rice), so prepare to really consciously eat for that perfect curry to rice ratio.